Increased defense and economic ties have Kiev and Beijing working closer together. It could come at a price. The recent conclusion of the Union of European Football Associations (UEFA) 2012 soccer tournament in Kiev, Ukraine, marked an important landmark opportunity. Ukraine attempted to demonstrate it was capable of hosting the 2012 Euro Cup without any major setbacks or acts of soccer fan hooliganism, terrorism or otherwise. In contrast to prior ugly displays of intolerance by a minority of Ukrainian soccer fans, much of the previous media-hyped fear mongering by detractors was proven to be little more than just that. While the fledgling national team got off to a promising start and ended in a controversial loss, their performance could be metaphorically viewed as a symbol of the promise and subsequent failings, in political and economic terms of the developing democracy’s quest for its own place in the world. This has often been tied to Ukraine keeping its cultural, linguistic, political and economic independence from Russian dominance and hegemony, especially as epitomized by the current regime of Vladimir Putin. The success, and then ultimate failure of the 2004 Orange Revolution, manifested by the return to power of current Ukrainian President Victor Yanukovych , and his authoritarian style policies, including the politically motivated imprisonment of Yulia Tymoshenko, shows that Ukraine has plenty of internal problems to overcome. Interestingly enough, a small but significant story has emerged during Ukraine’s struggles, in the form of the transfer of military technologies between Ukraine and China, and the fact that Ukraine is increasingly courting closer trade and economic relations with China. As well illustrated by Martin Shaefar’s article The Tryzub and the Dragon, in 1994, China was the fourth state to conclude an agreement on military and technical cooperation with Ukraine after 1991, when the former Soviet state was left with a large military-industrial complex. In 1998, a Soviet-era aircraft carrier, "Varyag" was sold to China. 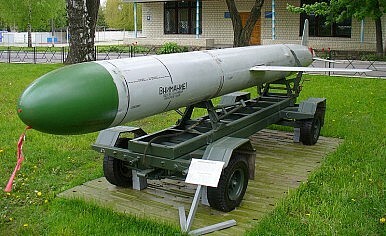 Reports have circulated that Ukraine in 2000 transferred several KH-55/AS-15 (NATO codenamed “Kent”) missiles to China. This was a significant technological acquisition for Beijing. The KH-55 has a range of up to 3,000 km and can carry conventional or nuclear warheads. This acquisition may have greatly enhanced China’s development of missile technology which were sold illegally, with another 12 also sold to Iran. Since that time, Ukraine´s state company "Ukrspecexport" (with offices in China, Egypt, Pakistan, and India) has been fairly active in arms trading, The Stockholm International Peace Research Institute (SIPRI) ranks Ukraine 12th in global arms trade between 2006 and 2010. Another area of important cooperation and growing bilateral trade between Ukraine and China is agriculture and agricultural production technologies. In June of this year, Chinese President Ju Jintao visited Ukraine during which both nations signed a variety of political and trade documents. Recently two deals worth almost $5.4 billion have propelled previously limited bilateral relations between Ukraine and China to the spotlight, establishing China as one of Kiev’s largest creditors. This comes amidst an increase of Chinese interest in the Central-Eastern Europe region. Bilateral trade stood at $8.5 billion in 2011, according to official data, a figure both countries hope to raise to $10 billion this year. The downside for Ukraine, however, is that such moves place the country arguably both politically and economically further from good relations with the U.S. and the EU, and possibly away from a path to true economic and democratic reforms, especially in light of the authoritarian policies of President Viktor Yanukovich. This of course also contradicts Yanukovich’s many public proclamations of Ukraine’s desire to ultimately join the EU. Nevertheless it is clear that continued trade and cooperation between Ukraine and China is poised to grow, particularly in the areas of space, aviation, defense sectors, and in information technology. This ultimately is also a blow to the U.S. and the EU’s attempts to expand their influence in Russia’s sphere of hegemony and use Ukraine as a natural counterbalance to the resurgent neo-nationalist policies of Vladimir Putin. In the short term at least, it seems that closer trade and economic cooperation with China mutually benefits both nations, at the possible cost of politically damaging Ukraine’s relations with the U.S. and EU. The final net effect on the Ukrainian people themselves will no doubt be negative, as Ukraine’s best chances of finding its own place in the global order and resisting Russian dominance remain with continuing to pursue true democratic and economic reforms, better relations with the U.S., and ultimately EU membership. Christopher Isajiw is an Editorial Assistant for The Diplomat. With tensions with Russia bubbling beneath the surface, China has been keen to build ties with Ukraine and Belarus. They’ve been happy to reciprocate.